A masterpiece of late 18th century topographical engraving. Nuova Pianta della Citta di Genova, e sue Fortificazioni con le Valli circonvicine. 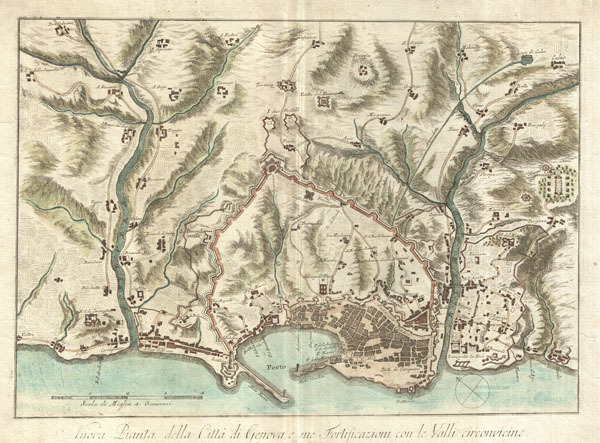 An beautifully engraved and extremely obscure 1800 map of Genoa or Genova, Italy. Covers the walled center of Genoa and parts of the surrounding countryside as far as Voltri in the west and Calzo in the east. Detailed to the level of individual buildings with a number of churches, monasteries, convents and private villas noted. The engraver, Bardi, is best known for his intense landscapes and engravings of classical sculpture where he is a master of rendering three dimensional concepts on a two dimensional plane. Bardi's translation of this skill into the cartographic medium is exhibited here in his superb freehand rendering of topographical detail. Bardi's work is extremely scarce and we have no evidence his work ever appearing on the market - though a few maps, including this one, do appear in a couple of major institutional collections. Please take the time to admire the masterful topographical engraving as it is among the finest and most artistically sophisticated we have seen. Giuseppe Bardi (fl. c. 1790 - 1810) was an Italian engraver active in Florence during the late 18th and early 19th century. Bardi is best known for his engravings of classical sculpture and Tuscan landscapes. As an engraver Bardi was an exceptional master whose work exhibits a delicate three dimensionality resulting from his freehand combination of multiple engraving techniques. Though his corpus of cartographic work is limited to a few scarce plans of Italian cities, each map is a masterpiece that bears heavy detailed scrutiny. His work as a pictorial engraving best translates with regard to his masterful approach to topographic representation. Due to the scarcity of his material Bardi's work rarely appears on the market and is little known. Manno, A., Bibliografia di Genova, #23762.